iHome Audio continues to innovate as the company expands its impressive lineup of AirPlay speakers. The new model iW2 is just like the original iW1, reviewed here, except iW2 is smaller, not quite as loud, and is AC powered only, instead of being also battery powered. In form and function both iW1 and iW2 are identical, except iW2 spent too much time in the clothes dryer and shrunk down in size. For a hundred dollars less, $200 compared to $300, iW2 lacks some of the larger unit’s audio power and all of its portability. iHome’s full retail price tags are being used here. Internet pricing is inconsistent for both products, so shop at a reliable local or online merchant for optimum value and customer service. The company does a stellar job with the included written manuals in English and French for iW2 and iW1, and with the functionality on the included full-size remote units. Within a few minutes of unpacking and following instructions, new users will be comfortable with all controls, and with using iHome’s free AirPlay iOS iHome Connect app. Wi-Fi networks are efficient at distributing AirPlay signals for music listening, but individual wireless networks can be erratic, causing occasional songs to appear to skip or drop during buffering. 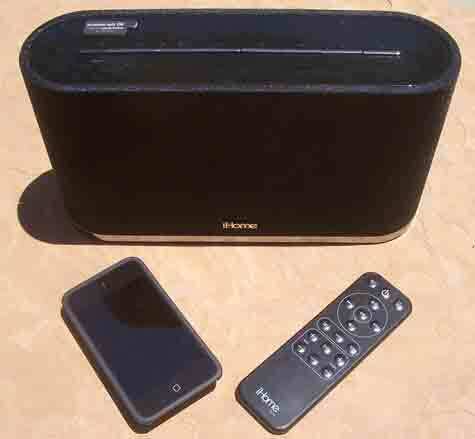 Wired Ethernet connections are more stable, so iHome includes an Ethernet port on its AirPlay speaker systems. The company tries to think of everything, but no Ethernet cable is provided. iHome Connect app setup is easy, but it can require a couple of unplug/replug of iW2 and power off/on of your iOS device. This is what happened with my iPod touch. Allow ten minutes for initial wireless setup. Soon your Pandora or MOG or other Internet streaming music will be flying across your room or patio with no strings or cables attached. Last night I asked my most severe critic, Mrs. Nemo, to listen and comment on the sonic performance from iW2. Pandora One was streaming at full volume on the iPod touch and iW2. She was sitting on the patio, thirty feet away from the speaker. I was controlling it from twenty feet away using the remote control. “It sounds very good, John.” And it did. Maximum volume at a decent distance yielded no distortion. You won’t fill a football stadium with the sound, but for home or small party listening, iW2 is perfect. As with most compact speakers, music sounds better at middle-plus volume levels, heard from across a room or outdoor space. iHome recommends users not apply any device’s built-in equalizer settings. Instead, turn on the Bongiovi DPS and raise or lower iW2’s treble and bass for your desired sonic experience. Top deck controls for most but not all settings on the stylish and well-crafted iW2 allow users to operate this speaker at close range, or when its battery-powered Rz14 remote unit is unavailable. When direct audio plug connection is required or desired, an auxiliary rear port is available. I began this review process intending to recommend potential purchasers save their money for the larger and more versatile iW1. It and Eton’s Sourla XL are the best battery-powered portable speaker systems we have reviewed. While testing iW2 I became fond of its compact size in situations where a larger and more imposing speaker are unnecessary. Music lovers on a more limited budget who want AirPlay wireless audio from a reliable company that values design and engineering will enjoy iW2 the first day they have it, and every day for years into the future.